Keep it clean every day! The new mats collection includes a wide range of indoor and outdoor use and complements the products in the field of interior decoration perfectly. These indoor mats are specially designed for indoor and covered the intermediate region. 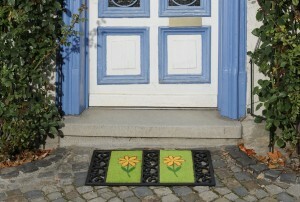 These are mats for fine dirt or dust or to highly absorbent, sometimes even washable floor mats. Whether at the front door, in the stairwell, in the hallway or in front of the balcony door – all our mats are an eye-catcher, sucking on wet or strip off dirt. To which they are a beautiful fashionable item. It is weatherproof and waterproof mats that have been specifically designed for outdoor use, to remove, developed by coarse dirt. The virtually indestructible mats are ideal for the non-covered entrance and remove most of the dirt before entering the house. Whether sun, rain or snow – about our mats always comes with clean shoes into the house. The outdoor mats, both on the doorstep, in the garden or in front of the garage, but are of course also used in the interior. They beautify any input.